"I cannot remember the last time that I received customer service like I have from Armstrong Steel. Our Armstrong Steel project manager, Jeremy, was extremely knowledgeable and assisted us at every turn. Kitty in the shipping department was on point and always had answers to our questions with respect to our scheduled delivery date. In short, everything went smoothly and you guys did everything we expected of you. I am sure that the other folks I didn't deal with directly are just as helpful - because it seems to be a part of your company's culture. 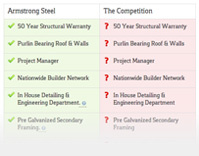 We'd recommend Armstrong Steel to anyone building a manufacturing facility!" "The quality of my Armstrong Building was excellent. The builder I used had not put up a pre-cut building before. He said it went together well. The few questions he had were answered in a timely manner. Armstrong's project managers worked him through the areas that were in question. I would use Armstrong Steel again. I recommend them for any steel building needs." "You guys are unsung heroes. Not many people know what you are doing or how important it is. Once again, my thanks to you and the rest of the staff." "I started by seeking quotes for a 60' x 60' x 14' building. Armstrong Steel appeared to be the most professional. Their quote was simple and easy to analyze. The contractor that I had pour the pad is currently in the process of erecting the building and has done several steel buildings within this community. He has been very impressed with the quality of Armstrong Steel. He and I would recommend Armstrong Steel if you are considering a steel building for any of your needs." "Just wanted to let you know that the building has been delivered. It was great doing business with Armstrong. I really appreciate how Armstrong worked with me when I ran into some hick-ups in the process. You folks are great, extremely willing to work with your customers and I would recommend you to anyone thinking of purchasing a steel building. As soon as I finish the project, I will be sending you some photos of the steps that I went through in erecting my building. Again, thank you and all the folks at Armstrong for a great experience with this project." "We initially sent a building deposit to a well-known steel building company in Denver who we later learned had an established reputation for stealing people's deposits and not delivering buildings. That was a huge mistake because we never got our building and they still have our money. Our first call should have been Armstrong Steel." "As I began searching for a steel barn, there was one company in particular that went out of their way to say some outrageous things about Armstrong Steel and desperately used scare tactics in an effort to change my mind. I'm glad I wasn't influenced by the lies. Everything has gone great, I couldn't be happier with Armstrong Steel and the way my building is going up! They have been there for me every step of the way." "I am very satisfied and would use Armstrong again as the end result was a good building. Thanks to the whole Armstrong team for the work they've done on this project. The steelwork went up beautifully. Patco said they had never seen a building go together so well. They said 'it was clear the engineers spent a lot of time developing it.'" "We recently completed construction of the equipment barn ordered from Armstrong Steel in late 2012. The Armstrong staff and engineers were very helpful throughout the entire process of the design and delivery of the building. The building was delivered on schedule, the components and parts were all present, all the predrilled boltholes were in the correct place, and everything fit per detailed plans provided by Armstrong. A crew of four men erected the 3000 square foot building (less rollup doors) in six days. I chose Armstrong for the building over bids from two very reputable local firms for several reasons and was not disappointed. Armstrong's bid was very competitive with the other bids, but I was most impressed with the overall quality of the materials to be provided, the attention to detail by Armstrong engineers, and the design help provided. I am very happy with my equipment barn. People who see the barn comment on the quality and appearance and ask me, 'who built your barn?' I would not hesitate working with Armstrong Steel on another building, and I am comfortable recommending Armstrong Steel to others for their metal building needs." "We are very pleased with the quality of our building! My husband & I spend a lot of time together in our building. He does metal work & welding, I enjoy jewelry making and stone polishing. We love how sturdy, secure and cozy it feels and the insulation keeps it pleasant to work in. We really love that our building is American Made!" " I'm in the aviation industry and my dad's worked with metal buildings for over twenty years. We love our Armstrong Steel Building. Armstrong wasn't the cheapest but, bottom line, YOU GET WHAT YOU PAY FOR! Going with the cheapest always winds up costing more in the long run. I'm glad I chose Armstrong Steel and that's why I insisted my friend Martin, who owns a flight academy, call them for his hangar (Cobra Kai Steel Hangar) too." "I felt that Armstrong really wanted to help me out, not just sell me something, and that meant a lot. From the moment I walked into Armstrong Steel, this place seemed like a big family and they were inviting me to be a part of it." "I was up in the air about a pole barn or a steel building. When I ran across Armstrong's website, their buildings caught my attention. They've definitely got the best quality steel building on the market so I called them up and bought a 60 x 42 building that same day. It delivered on my site complete and on time. If i ever build another shop it will definitely be an Armstrong Steel Building System. I honestly couldn't be happier and everyone who stops by says 'wow'!" " When I bought my building, I was afraid that it would be too big of a project to handle but Armstrong made it easy. 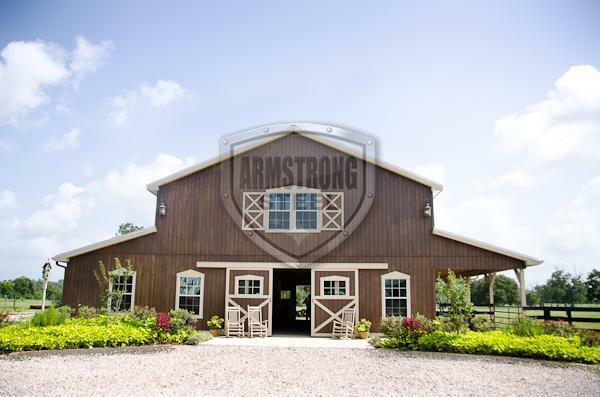 I needed a new barn, and while comparing my options, I discovered that an Armstrong building was equivalent in pricing to other wooden pole barns. It was so easy to erect that it only took four friends and I, one weekend. When friends see my building they love how it looks, they would rather stay in the barn than in the house! Highly recommended." "This was my first time buying a steel building and I'm retired. I went with Armstrong for my garage and woodworking shop because I needed a building fast and Armstrong was the easiest to work with. I called 3-4 other companies and didn't like the way they bad mouthed the competition. My favorite thing about my building is how good it looks and I'm extremely happy with the experience." " I've bought three previous steel buildings and I will say my Armstrong building surpassed each and every one of them. The detail that went into fabricating it was unlike anything i've ever seen. It was so easy, fit together perfectly and the trim package was super sharp. I use my building for car storage and this year we got 120 inches of snow here in Wisconsin. A lot of my neighbors roofs collapsed and mine didn't. Honestly, I wasn't even concerned about it. I LOVE my building. I've got heated floors and will be adding insulation this summer. My next building will most certainly be an Armstrong building." " I purchased a 60x120 for my new corporate office building. The process was easy, I was very satisfied, and Armstrong even met our tight deadline. The building arrived on time and wasn't difficult to erect! My favorite part of this building is the fit and finish. It looks great! We ended up getting a pre galvanized Armstrong Building System for less than anyone else could even sell a basic red iron building. I've already recommended you guys to several friends and contractors in my area. Thanks for a great construction experience." " I purchased my building in September of 2012, and had it delivered by December 2012. I bought a 3000 sq ft building for agricultural storage in Houston, TX. I was very happy with the quality and completeness of the building. Erection of the barn was completed in six days by four men, and all the parts fit flawlessly. I am very happy with my building, everyone who sees it loves it!" " My wife is a real 'do it your selfer' and we needed a garage and shop for her home improvement projects. Although most of the process happened by phone, email or mail, we feel the interaction we experienced during the project was the same as if we were able to come into the corporate offices and work with the project managers in person. The fabrication and delivery went exactly the way we were told. I was worried that if we were missing anything it would hold up erecting the building. We had one odd roll of insulation that was not delivered and despite a gap of a couple months between delivery and discovering the missing roll, the Armstrong Steel personnel got the missing roll to us in 2 days so erection was not delayed further. Not only is the building high quality, but we are also impressed with the components we purchased. The windows and doors and garage doors are all top notch! We are thinking about building a barn in the future and would definitely use Armstrong Steel again for future projects!" " I purchased a 30x40 for a workshop. Armstrong was easy to work with and their design staff was great with addressing every need. The drawings were well done and easy to follow. The building was engineered for the high amount of snow we receive. I received a great, low maintenance building, and couldn't be happier!"